It’s a term that is difficult to wrap your head around if you aren’t familiar with the software development process. The word itself is a portmanteau that meshes “development” and “operations.” In essence, it’s about efficiency – increasing communication and collaboration between development teams that write the code and operations teams that implement the code, to streamline deployment and reduce error. To determine how users of cloud service providers think about and use DevOps, we surveyed 247 organizations. All respondents held a manager level position or higher in their company’s IT department. Organizations ranged in size from sole proprietorships to enterprises with 10,000+ employees. The survey questions were included in a larger survey of opinions regarding Amazon Web Services (AWS), Google Cloud Platform, and Microsoft Azure. Therefore, all respondents use at least one of these platforms, with usage spread almost evenly among the three providers. The largest percentage of respondents agree with Wikipedia’s definition of DevOps. No single definition of the philosophy held a majority, though. 80% of respondents are very or somewhat familiar with DevOps. 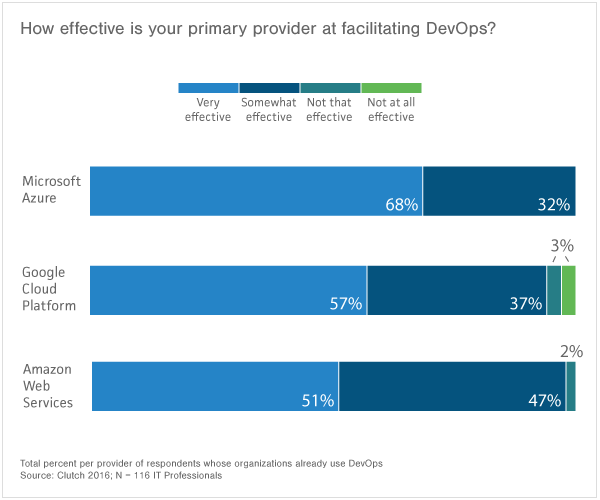 Microsoft Azure is more effective than Amazon Web Services and Google Cloud Platform at facilitating DevOps, according to our respondents. 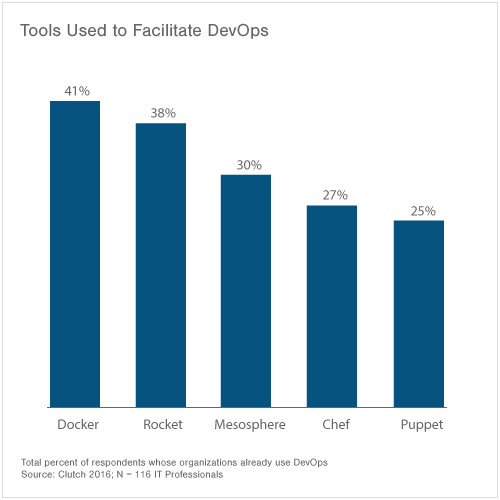 Docker is the most popular tool used to facilitate DevOps. In essence, DevOps emphasizes collaboration and efficiency. However, given its organic growth, a widely agreed upon description of DevOps remains elusive. Is there any way to pin down a singular definition? We asked respondents to pick the definition that best characterizes DevOps from four choices. Each definition contains distinct elements and was written by four separate and reputable organizations. We did not include the names of the organizations responsible for the definitions in the survey to discourage bias. Wikipedia’s definition was selected by the highest percentage of respondents, but the other three definitions garnered noteworthy support as well. 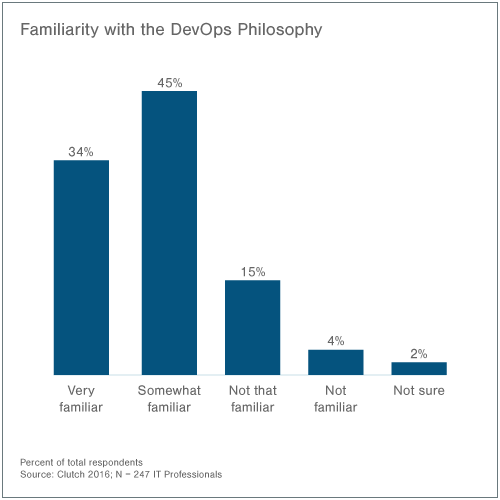 Experts also had different, and sometimes contradictory, points to make about this data, which emphasizes the lack of a widely agreed upon definition of DevOps. From the fact that no definition secured a majority and the differing commentary provided by experts, we can hypothesize that a widely accepted definition of DevOps has not yet been formulated. In many ways, depending on your end goal, DevOps is what you make it. 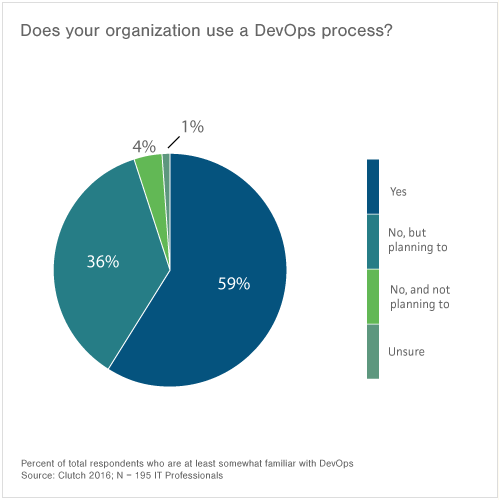 Almost 80% of our respondents were 'very' or 'somewhat familiar' with the DevOps philosophy, signaling a broad awareness of the term among leaders in IT departments. The Agile software development movement coalesced in the early 2000s, with the publication of the Manifesto for Agile Software Development by a group of software developers. The movement emphasizes fast and continuous delivery, heightened response to change, and collaborative and cross-functional teams. Agile methodologies often found success by uniting developers and testers on the same teams. In regards to implementation, 59% of organizations surveyed said they already use a DevOps process. Another 36% do not, but plan to. That’s 95% of organizations either using DevOps now or planning to sometime in the future. Hickman attributes some of the growing popularity of DevOps to the cloud, since it lends itself to a more flexible IT environment. The increased popularity of the Agile movement has also spurred DevOps growth. While the Agile movement often eased bottlenecks that accumulated during the quality assurance process, the DevOps movement seeks to break the silos down further and increase efficiency on the operations side. However, DevOps may not be quite as widespread among the general population as our data indicates. Our survey focused on IT professionals whose organizations already use either AWS, Google Cloud Platform, or Azure. Given that constraint, the data pool is likely more technologicallyinclined than the general population and thus may have greater investment in DevOps. Respondents indicated the beneficial impact of DevOps on their organizations. 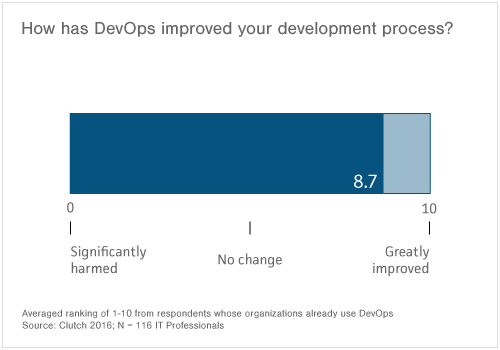 On a 1-10 ranking scale, respondents gave an averaged ranking of 8.7 to the question, “How has DevOps improved your development process?" A ranking of five indicated no change, while a 1 represented significant harm and a 10 represented great improvement. Eighty-seven percent (87%) of respondents marked 8-10, while 12% ranked 5-7. Only one respondent ranked DevOps a four or below on our scale. These elements are closely intertwined, but each has distinct advantages. First, automation allows you to reduce manual and repetitive tasks, as well as create more reliable systems, since a computer will catch errors in code better than a human. This term is often closely connected with the concept of DevOps, with many seeing it as integral to the philosophy. Martin of Cardinal Solutions doesn’t believe tools are a requirement. “It goes back to the definition that you provided, stating that DevOps is more about culture, bringing people together,” he said. Hickman and Dearman believe differently, though. “Companies can't program these things on their own,” said Hickman. When discussing tools, we found Docker to be the most popular – 41% of our respondents use it. Almost 70% of respondents said Azure is ‘very effective’ at facilitating DevOps, beating out AWS and Google Cloud Platform. Beware the buzzword. A concept like DevOps, which is already indistinct in so many ways, should be looked at with a critical eye as more and more individuals contribute their opinions on the topic. Since DevOps still lacks a broadly accepted definition, it’s best to take time defining the process for the goals of your own team before implementation. DevOps is broadly accepted by IT professionals. If your organization can benefit from DevOps processes, adopt them before being left behind. According to our respondents, Docker is the most useful tool for employing DevOps, while Microsoft Azure is the most effective of the “Big Three” cloud providers at facilitating DevOps. It may benefit you to look into these. You can’t deny that for many organizations, DevOps has greatly improved communication and efficiency. DevOps has achieved buzzword status, but it may just be because it works. Questions? Contact Riley Panko at [email protected].